You'd think that I'd be crazy-excited about a new compact camera that has 7 megapixel resolution, a 10X optical lens, and high definition video capture. And to some degree, I am impressed with the just-announced Canon PowerShot TX1. This device fits in your shirt pocket, yet can record full-motion video (to an SD card) and shoot 7 megapixel still shots. And like a dedicated video recorder, you can zoom the lens during capture -- something that many still cameras don't allow you to do in movie mode. And how about that 39-390mm optical zoom in a camera the size of a deck of cards? Wow. That is impressive. The TX1 is also Vista certified right out of the box, in addition to being Mac OS X 10.4 compatible. But it has two major shortcomings that will keep me from purchasing it. First, if you can record stunning high-definition video (1280 x 720 @ 30fps), but have to use an onboard microphone for the audio, what are you really gaining? The image is only half of the equation in movie making, and until camera manufacturers provide us with a microphone jack so we can record equally impressive audio, we can't use these devices instead of a camcorder. Also, I'm totally mystified by Canon's insistence on using the AVI Motion JPEG WAVE format for video instead of some flavor of MPEG. Using the AVI format, you get a whopping 13 minutes of continuous movie recording at 1280x720 resolution on a 4GB memory card. If Canon were to switch to an advanced MPEG format, they could quadruple capture time for the same amount of storage space. So, I have to view the new PowerShot TX1 as a potentially impressive still camera (10x optical with 7 megapixel resolution) that also records movies. But as a state of the art hybrid, it comes up short for me. The reason that the TX1 (and every other Canon P&S camera) uses MJPEG instead of MPEG is that primarily it is a digital camera. People buy it for taking pictures. It also takes great video, but that is secondary. It is easier to grab individual frames of video from a MJPEG file than an MPEG file since each frame of MJPEG is essentially a standalone photo. MPEG files depend on keyframes and difference frames (data that is different from the key frame). If you were to try and grab a frame of an MPEG file, you'd have to first look at the key frame and then add or subtract the difference frame. This would take much longer to do and would make video editing very slow as well. MJPEG has it's place. It's not a bad option. You can of course recompress the videos into any format you wish once you get it in your computer. Quicktime Pro allows you to export MJPEG files as any other format you wish. Hi Ambose, well, I don't entirely agree. Look at the TX1 and read the press release by Canon. They are promoting this as a digital video recorder too. It even looks like a camcorder. And I'd easily give up the ability to grab a full rez frame in movie mode in order to get more than 13 minutes on a 4GB card. I have a very cool Casio that records in MPEG in stereo and gets 30 minutes of full motion on a 1 GB card. It doesn't capture hi-def, like the TX1, although I'm sure to see something interesting from them at PMA. My point is, if it quacks like a duck, it should swim like a duck. The TX1 comes up a a few feathers short. Hi Derrick, for me, you're seeing the glass as half empty! ;-) There are always trade-offs when you have choose to make something this small. This is the most advanced compact camera that Canon makes that also does hi-def video. No one else (that I'm aware of) makes anything this small, this powerful, this video-capable. The only other camera that comes close to this is the S3 IS which is much bulkier. To mention the shortcomings is of course your prerogative and your job (as a journalist)! :-) If the camera produces excellent photos, captures smooth hi-def video and is this compact, I think it will sell in droves. Does anyone know if you can have full manual control over the shutter speed (i.e. up to 15 seconds for night shots)? I totally agree with Ambrose .... it just that we need to have larger capacity SD cards!! Derrick & Ambrose - you are both correct. 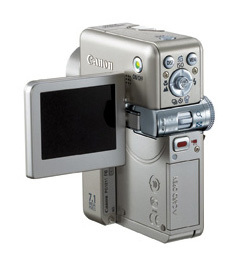 Canon blew it by not providing a method to connect a microphone BUT the MJPEG is an acceptable alternative for the still photographers looking to have a video/sound recorder in their bag of tricks. While it has some shortcomings, this "point & shoot" is still quite robust. I need a small still camera when I don't want to carry my DSLR. I need a video and sound recorder when I don't want to carry my MiniDV camera and separate sound recorder. This does both and it would be a homerun by Canon if they had added a microphone connection. You can't have something this compact with as many features and expect it to replace your HD Camcorder. It was never intended for this purpose but it would have been nice to record audio with a mic. Canon also blew it with their G7 by not having a 28mm lens or RAW capture. Someone needs to kick the marketing team out of the R&D department. Incidentally, your site has the most intelligent commentary on this new product at the moment. All the rest are just repeating the same drivel that Canon spit out for them. Thank you! "If you would like to place a priority on shooting time rather than image quality, select an icon with LP (Long Play) appearing on it. You will be able to approximately double the shooting time with the same file capacity." I'm assuming this is just a higher JPEG compression on each frame, but its still an option. This is not intended to bring an end to the camcorder market, it is intended put HD video capabilities in your pocket. Just as pocket sized cameras are not intended to replace SRLs, pocket cams should not be judged by their ability to replace a camcorder. They should be evaluated by their ability to capture impromptu short film moments. "It's like you're dreamin' about Gorgonzola cheese when it's clearly Brie time, baby." As to which video capture format is superior for a pocket cam, I prefer JMPEG as it offers superior frame capture over MPEG4. It's great to switch to video mode so that you can grab high quality stills that are not posed or composed. There are too many occasions when cameras and camcorders have failed to serve me in that way. "Leave it to a dago to bring a knife to a gun fight." If you need more than 30 minutes (8GB card x2) of video capture, it's typically something important. Why would you knowingly bring the limitations of a pocket cam into that situation? Would you want to be stuck holding a pocket cam that long, anyway?!? There are times when a dedicated camcorder is the order of the day; times when you should also have a tripod, an external mic, and a good idea of the shots you want. For everything else, there will be a TX1 in my pocket. As my two pockets also have to hold my wallet, phone, and iPod the TX1 is barely small enough for my carry everywhere needs. Even more than promoting it as a digital video recorder, far more than they do their standard P&S cameras, this thing is being touted as a digital audio recorder! One with no audio input... Oh except a sub-par compact built-in mic. It is unfortunate really, I'd be all over this thing if they would have though to include that one simple thing. Maybe the relatively short recording time per card will get some to discipline their recording! I seldom take more than 10 seconds per scene, and have learned that longer times can get boring very quickly without providing any more information. Just keep a couple cards handy, then put the video in your computer. I have a Sony DCR-PC100, the first upright style mini-DV camcorder. The TX1 does nearly everything it does, but better in a fraction of the size and weight. Present on PC100 and missing on TX1: nightshot; lens hood; external mic; webcam. Purple stripes are a problem shooting into even soft light - suggests less than ideal internal reflection control in the lens. Still working on a lens hood to see if it can be eliminated. One could capture and edit a short movie on the TX1 on a single SDHC card 4GB plus - but would have to be very ruthless with editing on the fly. With two cameras for two camera angles, movie making should be amazing. If Canon builds a TX2, it will be close to the perfect imaging tool. I was looking at this camcorder for a budding photographer/videographer (teenager). Besides this, what other camera can you suggest in the same price range. We have a 64bit vista machine - which we love despite the initial hiccups. Or outher cameras are nikon N75, a pentax k100 - I still like film - and a kodak digital for running around with.